This unique educational poster of poet E.E. Cummings features an artistic depiction of him, as well as a quote from "next to of course god america i love you land of the pilgrims' and so forth oh" and concise biographical text summarizing his life and career. E.E. 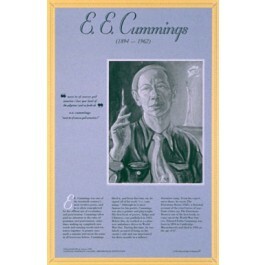 Cummings was one of the 20th century's most original poets, known for his offbeat use of vocabulary and punctuation. Although most famous for his poetry, Cummings was also a painter and playwright. 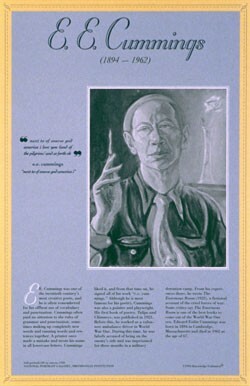 This poster is a great way to introduce students to this important 20th century American poet.